The La Liga outfit remained just outside the bottom three despite being beaten 2-0 by Atletico Madrid. Should Vigo be relegated, as reported previously, the fee for signing the big striker falls from €45 million to €22 million. However, they have a real scrap on their hands to avoid the drop with just six games left as they are now just one point clear of the third off bottom club Real Vallidolid. Manuel Pellegrini has made Gomez his No 1 target this summer but the Hammers are obviously hoping they won’t need to pay the full whack for the 22 year old Uruguayan. Spurs and Barcelona have both been linked with the player but Hammers insiders believe that is all about agents trying to create a competitive position in order to push up the price. 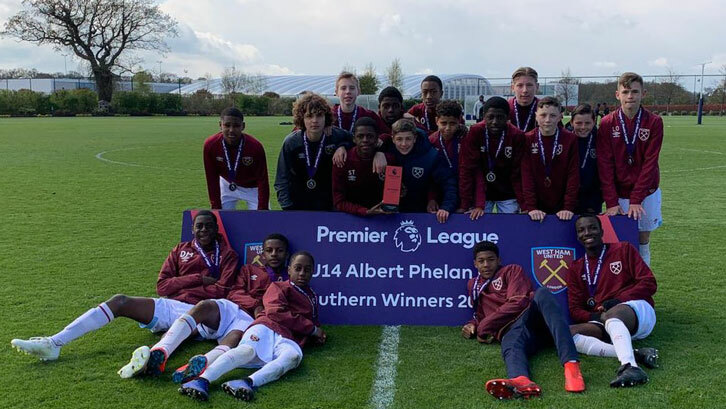 West Ham United’s schoolboys and first-year scholars enjoyed a successful weekend on both sides of the Atlantic Ocean. The Academy of Football’s U14 side won the prestigious Premier League Albert Phelan Cup, defeating local rivals Tottenham Hotspur 6-2 in the final, scoring four goals in extra-time. The final of the tournament, which is named in honour of long-serving Premier League games programme event consultant Albert Phelan, was hosted at Tottenham Hotspur’s Academy in Chigwell. A fortnight ago, the young Hammers had also overcome Crystal Palace in dramatic style in the semi-finals, scoring a late equaliser to draw 2-2 before triumphing in a penalty shootout. Prior to that, the Irons had beaten West Bromwich Albion in the quarter-finals. On the other side of the Atlantic, the U17s made a perfect start at the 2019 Generation adidas Cup in the United States. Kai Corbett was the hero, scoring the winning goals in 1-0 Group A wins over Club America of Mexico and MLS side NY Red Bulls. The Hammers will face host club FC Dallas, who have also won both matches without conceding a goal, with the winners topping the group. Both teams are already through to the quarter-finals. You can watch live coverage of the game at 7.45pm on Monday evening UK time here via the MLS website. The knockout stages will then begin on Tuesday, followed by the semi-finals on Thursday and the final on Saturday 20 April, which will be played at the 20,500-capacity Toyota Stadium. Don't players and agents get a percentage of the fee? Geep, if they are relegated the release clause reduces to €22m. Nobody will pay more than that as it will do no good. Example - if we offered 45 million and Barcelona offered €22m then it would be down to the player's choice. Celta would have no say in the matter. They would have to be something like he can go wherever he likes so long as the destination club meets the set fee. And then he'd have to prefer us. It's like an auction - if the reserve price is halved, it doesn't mean the final price is. "Should Vigo be relegated, as reported previously, the fee for signing the big striker falls from €45 million to €22 million." Why would the fee be cut in half if they're relegated? They can still sell to the highest bidder.